get excited ... chicago welcomes another top chef! this time, it's top chef season 5 fan favorite : chef fabio viviani. fabio partnered up with a couple of veteran chicago restauranteurs to create siena tavern, where the "sophistication and charisma of viviani's cuisine" shines. the restaurant is located at the corner of n. dearborn & w. kinzie street in river north ... a fun, bustling area ... the perfect place for a girls night out. we all know i can't pass up some shishito peppers. these were a simple version. flavorful, but not spicy. perfectly crispy. 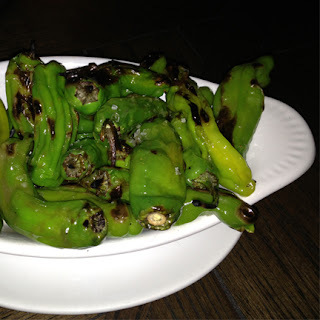 pepperoncini, roasted pine nuts & torn mint. wow. in my opinion, cauliflower can be boring as hell. not this version. the pepperoncini added just the right amount of kick ... cooled down if you were lucky enough to get a bite of the mint. 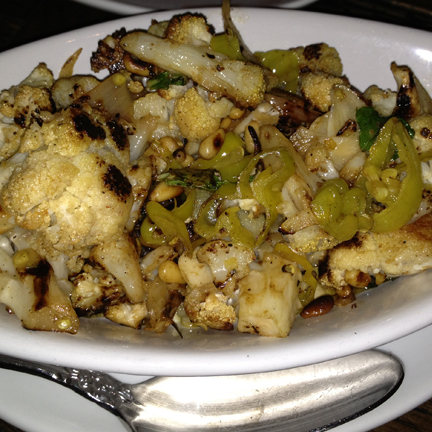 the cauliflower was also perfectly roasted. i could eat this all day. pesto, artichoke, toasted peppers & zucchini. 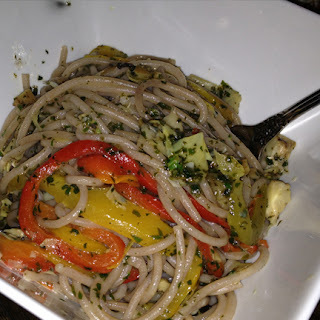 a vegan variation of the farro pasta menu item. i've gotta say. i was pumped for this. mostly because i thought it was just going to be farro. but farro turned into pasta? honestly, genius. it was soooooo flavorful. so much more so than regular or brown rice pasta. i loved it. the pesto was also delish. another dish i could eat all day. siena tavern is definitely a fun place ... a new favorite for me! i highly recommend to any fabio fans (& i know there are a lot of us!) ... or anyone else looking to try something new. i know i will certainly be back.